I love Hong Kong. I love the noise, the vibrancy, the buzz of people, the colour and the wafts of delicious smelling food. (To find out more about the local cuisine, try a food walking tour) It is a city that is constantly on the move and is always changing. 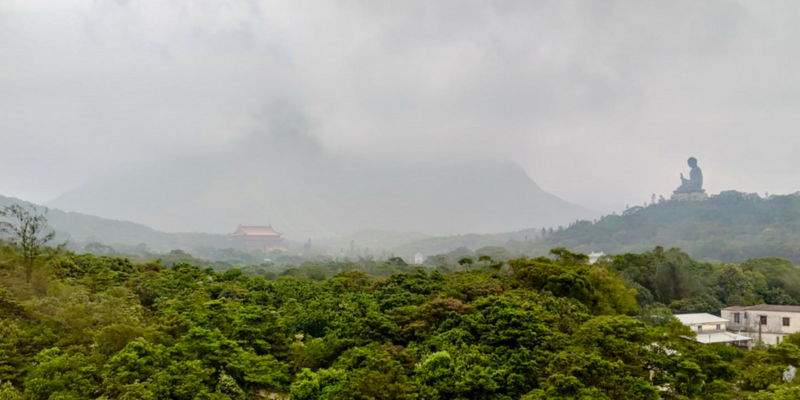 After I had spent a few days in Hong Kong, I decided I needed a quick break from all of the hustle and bustle, I needed to escape to somewhere with a slower pace and uninterrupted horizons. It wasn’t as hard as you think, in fact, it was very simple and affordable. There are lots of easy day trips from Hong Kong that won’t break the budget and take you to a new location. It is amazing how easy it is to leave the densely populated city in a matter of minutes. Here are my favourite 3 easy day trips from Hong Kong. Dragon’s Back Hike appears in most top things to do in Hong Kong lists, despite this, it isn’t overly crowded or full of tourists. Nearly all of the people I saw along the trail were locals in search of their own Hong Kong city break. Don’t be put off by how far away Dragon’s Back Hike is, it is actually very easy to get to. Well… if you don’t mind walking, and I am assuming you don’t if you are looking into doing a hike. 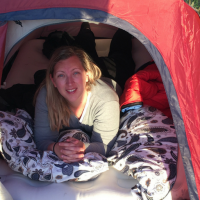 After doing a little bit of googling, I found this fantastic blog which gives detailed instructions on how to get to the start of the hike by foot and public transport. Not going to lie to you… the first part is hard, it involves climbing over 100 stairs. Don’t let that put you off though, it is the hardest part of the whole hike and the views are worth it. Once you reach the Dragon’s Back ridge, the walk is relatively easy through bush and scrub. You are propelled forward by the glimpses of a fantastic view through the trees. There is some hill climbing when you reach the peak section, but after the stairs, it feels pretty easy. Once you crest the first hill, your mouth will gape. The views are stunning. It is almost impossible to believe that half an hour before you were in the centre of one of the worlds biggest and most densely populated cities. Suddenly you are standing on top of a mountain with nothing but the ocean rolling away beneath you. When you finish the hike you come out on a road. There is a bus stop on each side – in one direction you can go back to Chai Wan MTR Station, or if you go in the other direction you will end up at Shak O Beach. I STRONGLY recommend going to Shak O Beach. This sleepy little town is the epitome of all beach escape locations around the world. It has juice cafe’s, bars, people selling beach chairs and stunning views. Make sure you pack your swimsuit so that you can go for a swim after the hot hike. At the end of the day, you can easily grab a bus back to the MTR station. You return feeling refreshed and revitalised after spending a day hiking and lying at the beach. What more could you want from an easy day trip from Hong Kong? Travel Tip: This was one of my cheapest days in Hong Kong. I used public transport to get to and from the hike and beach to keep costs down. Make sure you take plenty of water, as it is very humid and dusty while you are doing the hike. At Shak O Beach, there are plenty of delicious and budget-friendly places to eat. 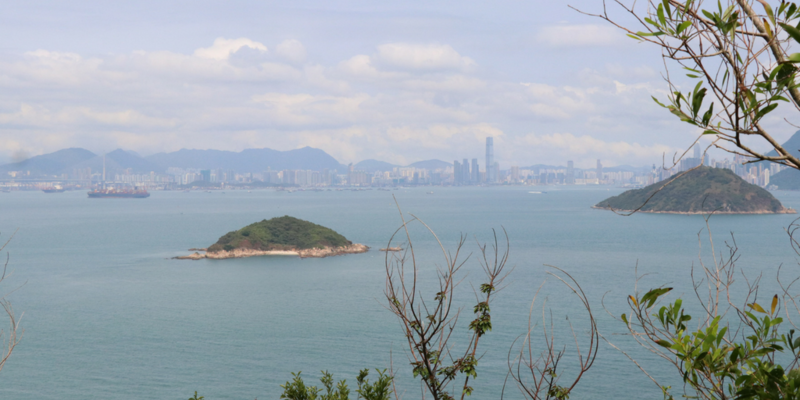 It can be easy to forget that there are many more Islands in Hong Kong other than the big ones that make up the city. The public transport system in Hong Kong is so fabulous, that you can get pretty much anywhere by either ferry, train or bus. One of my favourite easy day trips from Hong Kong is to just jump on a ferry and go island hopping. You can spend numerous days visiting the many different islands, but if you only have one day, here are the two I recommend. Grab the ferry from central, everything is easily signposted so you won’t have any trouble finding it. Before I went, I read that there is a difference between the fast ferry and the slow ferry. Some bloggers recommended catching the slow ferry in at least one direction to the island to take in more of the views. Don’t bother doing this. The difference between the two ferries is 10 minutes, you still have enough time to snap pictures on the fast ferry. However, if you are looking to save some money, then catch the slow ferry… it’s only 10 minutes slower after all. Cheung Chau is quite a large island and has a similarly large village. The island doesn’t have any cars on it though, so the only way to get around is by foot or bicycle. There are loads of bikes you can hire. I chose to walk around… it is really a small island. You can do a number of walks along the island ridgeline, or along the water’s edge. Spend some time walking through the laneways of the village as well. I loved seeing the fisherman drying out all of the seafood that you see in the markets on the bigger islands. If you are hungry, there are some fantastic waterfront seafood restaurants that are reasonably priced. But like all touristy hot spots, for the best deals, go back a couple of streets and look for where the locals are eating. 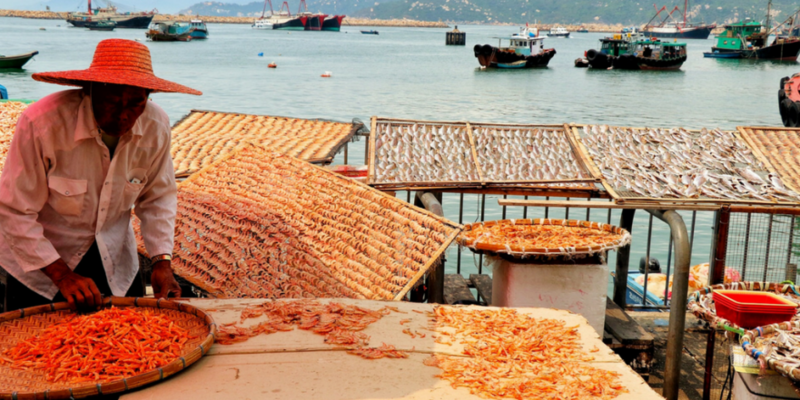 You can grab a ferry straight from Cheung Chau to Peng Chau. it takes about 30 minutes and comes every hour. Peng Chau is a more relaxed version of Cheung Chau. I liked this island better as it didn’t feel so hectic. I climbed up the ridgeline on the island to their lookout. Like so many places outside of the city in Hong Kong, I was blown away by the fantastic views. This time they were looking back towards Kowloon, showing off its fantastic skyline. Climbing back down I grabbed an ice cream and just spent an hour or so walking around the sleepy fishing villages. Everyone I met and spoke to was super friendly and helpful. I also noticed that there were a number of luxury villas being built. I can see this sleepy fishing village turning into a holiday resort soon. So if you are looking to head here for easy day trips from Hong Kong, go ASAP! When you are ready to head home, you can easily jump on a ferry at Peng Chau that will take you back to Central. This Hong Kong day trip combines culture, hiking and beach time all in one. The Big Buddha can be quite touristy, so I recommend going early to beat the crowds. You can make this a half day trip if you have a lot to squeeze in, or take your time and see more. Catch the MTR train to Tung Chung station. From here you can walk up the mountain… or thrill seekers can take the glass bottom chairlift up. The chairlift alights at a small mountain village called Ngong Ping. If you didn’t have time for your morning coffee, don’t worry, there is a Starbucks here. It is a bit of a tourist hub, but that doesn’t detract from its beauty. As soon as you get off the chairlift you can see the Big Buddha, towering over everything. As you walk towards the Big Buddha, on your left you will see the Po Lin Monastery. I strongly recommend stopping off and having a look. It is a beautiful and peaceful place, despite the tourists. Once you reach the Big Buddha, you can pay to go up into it… I didn’t feel any need to do that. After all, I wanted to see the Buddha itself. From the Buddha, there are a number of walks you can take through the national park. It’s quite fantastic how many different excursions there are. If you have more time in Hong Kong, I definitely recommend doing several day trips here to explore them all. I took the Tei Tong Tsai Country Trail. It is relatively easy as it winds down the mountain with fantastic views out over mountains. My favourite part though, was when it wound passed the many communities that dot the mountainside. Giving me a unique view into the lives of the people who live here. At the end of the trail, you arrive at another monastery, Teung Cheung Lo Hon monastery. The monastery is situated at the edge of a small village where you can catch a bus from. If you still feel like some more exercise you can hire one of the O-Bikes or other bike share options, and cycle to Tung Chung to catch the MTR. 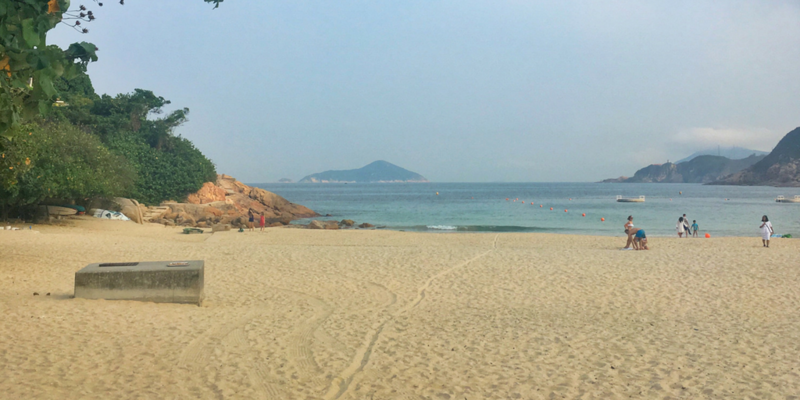 If you are looking for some food and beach time, then grab a bus to Mui Wo. 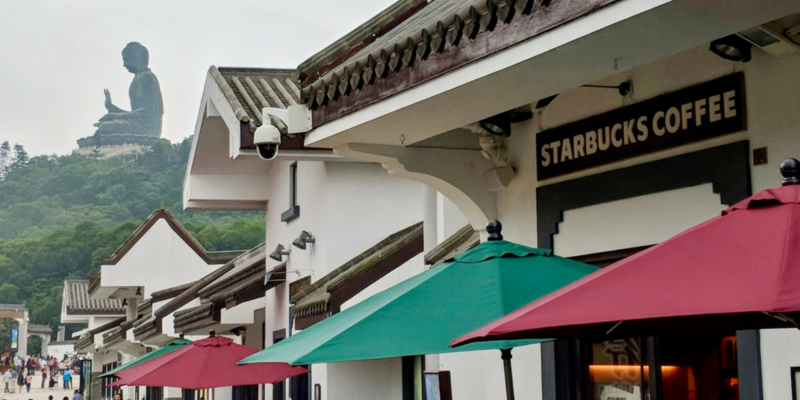 The bus takes a while, and winds through the mountains, so if you are looking to do a half day trip definitely go the other way to Tung Chung. When you arrive at Mui Wo, head towards the water. Here you can grab a delicious seafood feast or head to the beach for some downtime. When you are finally ready to head back to the hustle and bustle of Hong Kong you can catch a ferry straight from Mui Wo to Central. 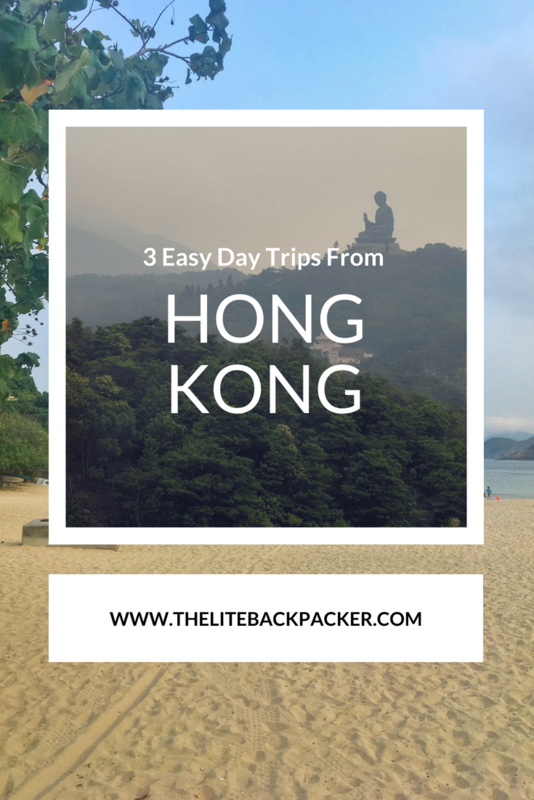 What an easy day trips from Hong Kong! What are your favourite easy day trips from Hong Kong? Or have you done any of the above and have anything to add? If so, use the comments below to let me know!